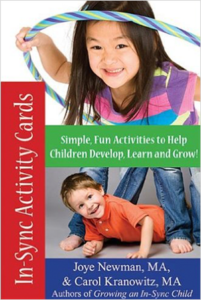 In-Sync Activity Card Book: Simple, Fun Activities to Help Children Develop, Learn and Grow! Based on the In-Sync Program described in the book, Growing an In-Sync Child, these handy cards bring 50 more fun and flexible activities to help all kids grow, learn, and develop to the best of their abilities! Divided into beginner, intermediate, and advanced activities, each card tells you why and how the activity works, what you need for it, ways to make it more challenging, and what to look for. These cards are now available in another version — The In-Sync Activity Card Book.